Finally, some meat... I spent an entire day hand twisting 18ga stranded wire into 8' long pairs with various colors. Right side channels use Red as the (+) side, Left side channels use Blue. I created custom RCA cables and wired the amp to crossovers, crossovers to wiring harness, using the hand-rolled twisted pairs. It was a tough job that gave me 7 blisters on my two hands, but it was worth it! My system has absolutely no noise, no interference, and it looks great. Twisted pair is the best choice for the car. Just look at what BMW used - twisted pair all over the place. I wired the power for the amp directly from the battery using 8ga Monster Cable power wire. Thanks BMW for putting the battery in the trunk! This was a very easy job. I ran the wiring from the battery compartment, along the other two monster sized cables under the right trim panel in the trunk, and up under the deck to the amp. 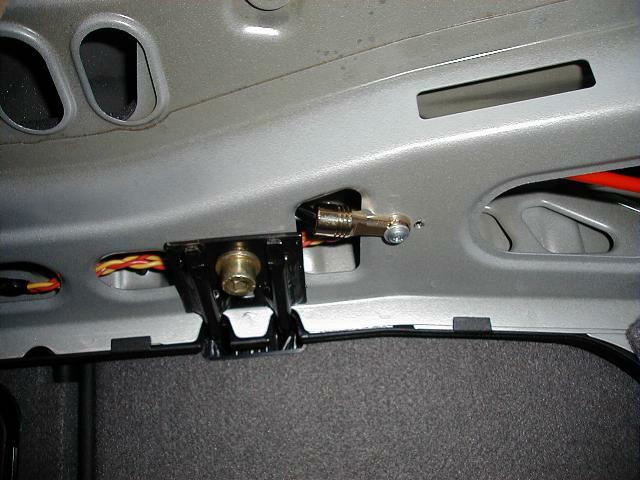 The ground wire is short and sheet-metal screwed to the underside of the rear deck. Be sure to use the same guage wire for both power and ground. This minimizes noise. Here is the detail of the wiring connections I used. Please note that I only used a subset of the available pins because the factory system has 10 individual loudspeakers. My system effectively has 6 since the rear speakers are coaxial. This leaves the 2 front midrange drivers and the 2 rear tweeters disconnected and unused. 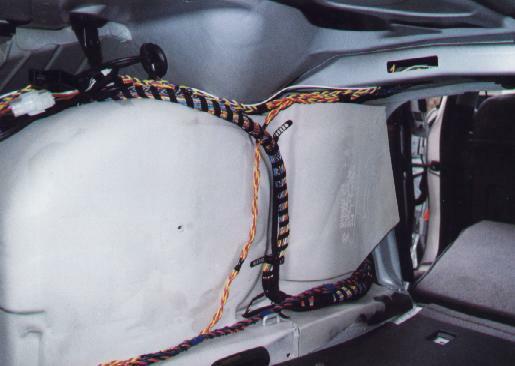 I also wired the rear speakers directly from the crossovers, which leaves the rear woofer connections to the harness unused as well. This is the baby that delayed my project completion. No aftermarket companies make wiring harness interface connectors for the E39. All of my research showed that they may be coming out with them, but didn't have them now. So, it was up to me to make my own. I contacted Amp in Germany to get a matching male connector to interface with the female connector on the factory harness. Even in Silicon Valley I could not find a suitable connector for this job. So, I was on my own! After coming up empty, my colleague Sherman informed me that it's possible to get "samples" from component manufactures. So, I called Amp (see references section for contact info) and spoke with the designer of the part in the car. He gave me the part number for the matching connector and I ordered some samples. I did mention I needed the pins as well and assumed they'd be shipped with the connector, but with my luck they didn't arrive. Another call, another conversation, and the pins were on the way. One thing I have to tell you is I'm colorblind. So, referring to the colors on the wires is not an option for me. I had a friend map the positions for me so I could do this without assistance. I provide the info I got from Willard Lee for your reference only. Be sure to double check all connections before you go with them. I used a digital voltmeter (DVM) with a tone setting to identify each speaker wire. This was a little tricky. I manufactured my own 26 pin connector using the above mentioned 26-pin shrouded header. The pins are so close together that I had to solder on 6" solid core wire leads, then connect the stranded pairs to these leads. You're in for a treat doing this part. Use a pencil point soldering iron, isolate the bottom row of pins from the top row with something, and be sure to use shrink tubing around each individual connection to insulate them from eachother. I suggest buying a few extras in case you mess up. Also, be sure no solder dripped and connected two or more pins together. That would be really bad! When connecting RCA plugs to the harness remember that the center post on the RCA plug is the positive lead from the harness.